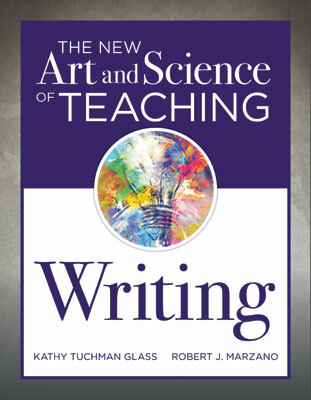 This book provides a nuanced explanation of how teachers can apply the strategies and techniques in The New Art and Science of Teaching to the teaching of writing. This book takes the framework in The New Art and Science of Teaching and offers more than one hundred detailed strategies for and examples of implementation. Throughout the book, the authors address ten teacher actions from The New Art and Science of Teaching within the categories of feedback, content, and context. They focus on how the forty-three elements embedded in these categories specifically apply for teachers of writing. Each chapter includes self-rating scales that readers can use to assess their performance on each element. By doing this, they can determine their areas of strength and the areas in which they might want to improve relative to The New Art and Science of Teaching. Each chapter ends with Guiding Questions for Curriculum Design to help with planning. Kathy Tuchman Glass, a consultant, is an accomplished author and former classroom teacher with more than twenty-five years of experience in education. She provides professional development services to K–12 educators with a focus on areas concerning curriculum and instruction. Robert J. Marzano is the cofounder and chief academic officer of Marzano Research in Denver, Colorado. During his fifty years in the field of education, he has worked with educators as a speaker and trainer and has authored more than forty books and two hundred articles on topics such as instruction, assessment, writing and implementing standards, cognition, effective leadership, and school intervention.